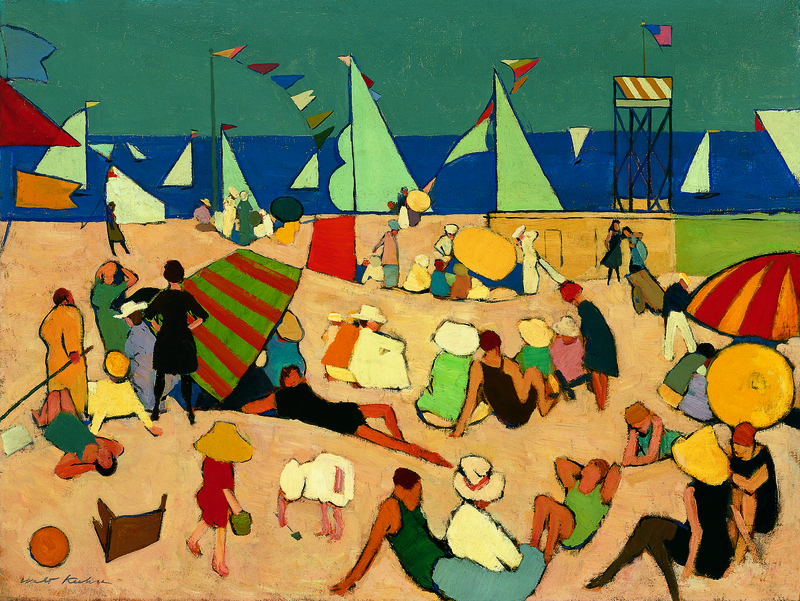 Walt Kuhn depicted a scene of leisure on the beach which has a long-lasting tradition in modern painting. In the 19th century the olden times, idealised pastoral scenes were transformed in direct images of bourgeois recreation. French painting since Boudin, Manet, the Impressionists and post-Impressionists, had dealt with this subject frequently, and Kuhn had been influenced by them thanks to his travels around Europe in 1901 and 1902, first as a student at the Colarossi Academy in Paris, and later in the Munich Academy. He also had precedents in American painting, both in the scenes of strolls and outdoor sport activities by Winslow Homer and Thomas Eakins, and in Maurice Prendergast's beach scenes. Kuhn painted Bathers on a Beach during one of his summer holidays in Ogunquit, on the coast of Maine. He divides the composition in three horizontal bands which represent the sand, with the soft undulation of the dunes, the sea and the sky, and into them he distributes the groups of figures, as well as the triangles of the sails and pennants. Although rather full of elements, the painting has an order which exemplifies Kuhn's interest in giving his compositions a rational and abstract structure, even if subordinate to the naturalist representation. Kuhn had explored abstraction, or at least the geometrical reduction inspired by Cézanne, in a number of paintings which he mostly destroyed. Here, the triangular and rectangular shapes are sharply set against the blues of the background, giving a vertical tension and a dynamic rhythm to the dominating horizontality. Its lines and right angles contrast with the curves of the simplified figures, lacking in details and physiognomical traits, and defined by flat patches of colours and dark outlines. 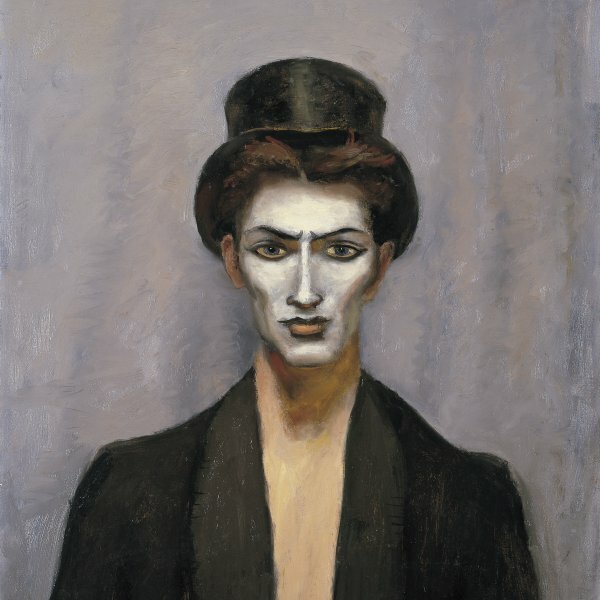 This painting, executed two years after the famous Armory Show exhibition which Kuhn actively helped to organise, gathers and integrates elements of his experience in Cologne, Paris and London in 1912 during the preparation of the exhibition, which might have strengthened previous artistic intuitions. During the First World War, Kuhn manifested a penchant for post-Impressionism. In the case of this picture, the connection can be made with Prendergast's work in the application of clearly defined stains or patches of colour. But his vibrant sense of colour is more strongly fauve, as is his composition of the figures through sinuous outlines which he himself defined as "arabesques", which link him to one of his most admired masters, Henri Matisse, although Kuhn might also have been familiar with Kandinsky's works from the Murnau period. In Bathers on a Beach the artist creates light through colour, avoiding the use of shades or shadows, to concentrate on the contrasts between colours: black and white are the extremes of a wide repertoire of yellows, greens, blues and above all of strong touches of red. These chromatic relations add to the texture effects which Kuhn tries to obtain by applying oil paint thickly. Sometimes the patch is painted with parallel brushstrokes; at other times he eludes the subjective stroke of the brush by flattening the colour. He does this by applying paper on the fresh paint, so that by putting pressure on it the mark of the brush is attenuated. The difference in the treatment of the colour texture gives a greater tactile quality to the figures on the sand, which brings them closer to the spectator, while the reduction of the medium and the cold colours of the sea and the sky create a receding background.